Braves getting ready to start the game with a team cheer. Over the past two weeks, the Brave girls’ lacrosse team played four games, losing two and winning the remaining two. The first game was faced against the Ingraham JV team on Saturday, April 23rd, which ended in a 14-8 loss. Major goals of the game were scored by Morgan DeMeulemeester, Laura Simmonds, Molly Olney, Sophie Butler, and Rory Knowles. Doing an outstanding job protecting the goal, Katie Cogar showed off what she does best with 10 saves. 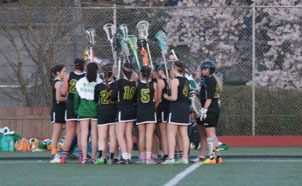 On Tuesday, April 26th, the team left the field with a win over the Newport-Sammamish-Interlake team 13-11. Freshmen, Lindsey Rappe and Rayden Berge, performed in the goal with numerous amazing saves. Goals were scored by Sophie Butler, Olney, DeMuelemeester, Simmonds, Alina Gemza, and Anabel Roza. Leading scorer throughout the game was senior Roza, with 5 goals in overall. Following the game on Tuesday, the team took yet another outstanding win over the North Olympic team 15-4. Seen in the goal was freshman Kristina Binder, with 6 saves total. Goals that contributed to the game were scored by Belle Thornburg, DeMuelemeester, Butler, Simmonds, Roza and Olney. An outstanding game was played by sophomore Gemza, who led the team with 5 goals. On Tuesday, May 3rd, the lacrosse team closed their season with a 14-11 loss against Lake Sammamish. Final goals were scored by DeMuelemeester, Olney, Gemza, Knowles, Roza, and Simmonds. Protecting the goal was Cogar with 3 saves and Kristina Binder with 6. The team concluded their first ever season on a fantastic note, finishing 7-3. The team would like to thank all the fans that came out to support throughout the season.